Home News Can Cincinnati learn from Paris’ famed Velib’ bike sharing program? Can Cincinnati learn from Paris’ famed Velib’ bike sharing program? When I stepped out of the Edgar Quinet Metro station and onto the street for the first time something immediatley caught my eye in this neighborhood of Paris, France. Within just a few minutes I noticed something that I did not expect. Not only were there a ton of people riding bicycles around the neighborhood, but most of them seemed to be riding the same model bike. It was slightly different than a normal bike, and stood out in a way that made them all noticeable and different than a more normal bike on the street. 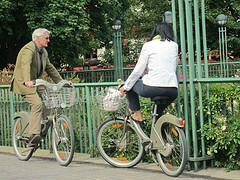 I thought to myself, what is it with these Parisians and their funky bikes? It didn’t take much time walking the streets to continually notice these bikes just about everywhere and once I came across a whole bunch of these bikes parked at a station it started to make sense. Then there was another station; and another station. No wonder these bikes were everywhere, they were available everywhere. 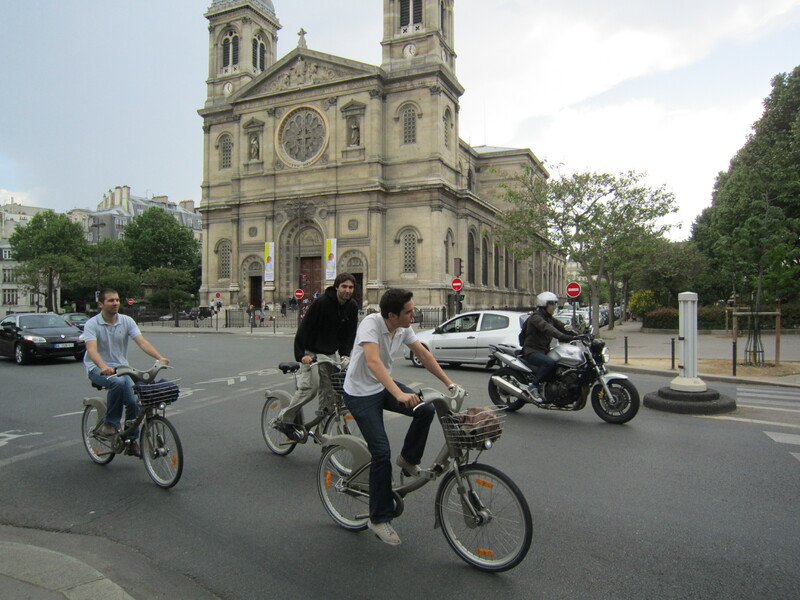 What I had stumbled upon was the Velib’ bicycle program which was started four years ago in 2007 and was championed by Paris Mayor Bertrand Delanoe. 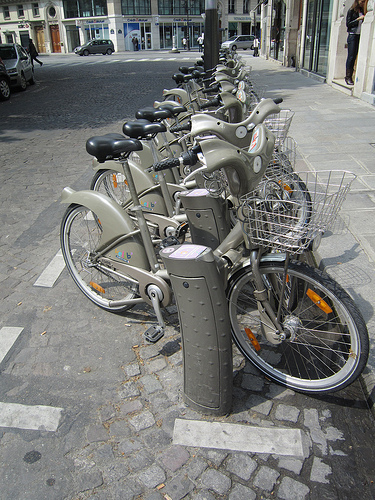 It is a bicycle sharing program that is available throughout the city of Paris and is designed to be a short term rental where riders can pick up a bike at one station and drop the bike at any of the other 1,800 stations (averaging one every 330 yards) throughout the city. All it takes to get started is scanning a credit card at one of the stations and off you go through Paris on two wheels. A subscription is necessary which can be purchased in daily, weekly, or annual incraments and range from $2.50 for a day to $41.50 for an annual pass. The first thirty minutes of each ride is free, which of course encourages Parisians to use the bikes on short commutes, and after thirty minutes the rider must pay service fees. The program was reportedly a wild success when it was rolled out four years ago, but it is not without its problems. There have long been reports that the program which was funded and is run by ad agency JCDecaux is too costly considering the maintenance, theft, and vandalism to the bicycles. Through the contract the advertising agency has exclusive rights to the over 1600 outdoor billboards throughout Paris, but all of the money from the fees for the program itself go back to the city of Paris. Users of Paris Velib’ – Photographs by Dave Rolfes. Clearly, Cincinnati is not Paris from its sheer size and even bicycle friendliness at this point, but seeing this program made me wonder what our city could learn from it. Sure we cannot support 1,800 stations and of course we do not need 20,000 bikes on the street, but is there a scalable way to do this type of program in our region? I would propose that there is. With a focus on the urban core, stations could be set up both north and south of the river from historic Over-the-Rhine in the north, to Bellevue, Newport, and Covington in the south. Our urban core is relatively flat and allows for easy riding from one place to another. There could be stations set up in other neighborhoods as well throughout the city, Uptown and Northside come to mind as obvious choices, and even some of the other city neighborhoods could support a program like this. It would definitely help to change the culture in Cincinnati, as it has Paris, by putting more bikes on the road and helping our citizens become healthier. Additionally, as there are few other programs like this in the United States, it would continue to further position Cincinnati as a city that can be environmentally friendly and progressive in its thinking.